That was the end of Richard’s resistance. The Lords Appellant marched their army back to London where they encamped at Clerkenwell and paid a visit to the king who had taken refuge in the Tower. In the last week of December, the five lords entered the Tower with 500 heavily-armed followers and shut the gates behind them. Richard took them into the privacy of his chapel and nobody really knows what went on behind that closed door. There’s a story that Bolingbroke drew Richard to the window and showed him the mob outside waiting to depose him. Undoubtedly the lords berated him for his duplicity and insisted that he arrest the five “traitors”. 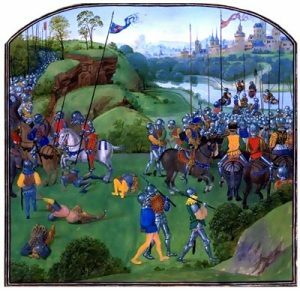 It seems there is a consensus among historians that Richard ceased to rule the last three days of 1387; a strong probability exists that he was actually deposed for two or three days—at least Gloucester admitted such in his last confession ten years later. It is thought that Gloucester wanted the crown for himself, but Henry of Bolingbroke wouldn’t go along; his father’s claim—and therefore his own—was stronger. So in the end, they decided to put Richard back on the throne. The immediate crisis was over, but Richard would neither forgive nor forget his humiliation and degradation. Sadly for him, the worst was yet to come. This entry was posted in Politics, Uncategorized and tagged Battles, England, Europe, Medieval, Politics. Bookmark the permalink.